More than eighty developing countries suffer from chronic food deficits and about eight hundred million people live in hunger. By 2025, the world's population may exceed eight billion and food needs in developing countries may double. The challenge for these countries and for their development partners is to assist farmers in achieving food security - the basic right of people to have access to the food they need. This challenge is most critical in low-income, food-deficit countries where little progress in food production has been made in recent decades, leading to a dramatic increase in the number of chronically undernourished people. The challenge of ensuring food security in developing countries calls for new technologies, skills, practices and ways to collaborate. Most importantly, farmers must be able to communicate with peers, local authorities and institutions and have access to relevant knowledge and information, including technical, scientific, economic, social and cultural information. It is essential for rural people to be able to respond productively to the opportunities and challenges of economic and technological change, including those that can improve agricultural productivity and food security. However, to be useful, information must be available to the users in appropriate languages and formats. At the same time, it must also be up-to-date and communicated through appropriate channels. Since the beginning of the 1990s a dramatic expansion in information services and a proliferation of technological innovations has permeated virtually all spheres of human activity. The depth and the extent of these processes appear limitless and have had much greater social, economic and cultural implications than experienced during previous technological advances. The so-called Information Age, characterized by a world-wide increase in the reach of mass media and the emergence of the Internet, is affecting the way we communicate, create relationships and undertake transactions, opening up new opportunities and challenges. Developing countries have not been excluded from these processes. Despite the seemingly huge difficulties in infrastructure development, their governments have taken steps to adapt to the new digital environment and to avail themselves of new tools, products and services. With the emergence of new opportunities there is however a growing concern about a new kind of threat to global development which has fuelled an animated world-wide debate over the social impact of ICTs on the lives of people. In the North-South context discussion has focused on the role of technology in widening or narrowing the knowledge gap between rich and poor countries. The situation is even more dramatic for people in rural and isolated areas of developing countries, where access to basic telecommunication services and educational resources can make a real difference in combating poverty and improving living conditions. These people have no access to the mechanisms that would enable them to voice their opinions, communicate with authorities and the main development actors or increase their participation in decision-making processes. The gap is thus growing not only between North and South, but also, and more dramatically, within the South, between the urban elite and middle classes and the most underprivileged populations living in rural areas. Impressive breakthroughs in information technology and its increasing presence in everyday life have led some observers to believe that ICTs would provide immediate solutions to development problems. The initial optimism of these technology enthusiasts has been tempered in more recent years by a close scrutiny of actual technology applications at the local level. ICTs are perceived as being able to facilitate speedy integration of rural areas and to enable the enhancement of a number of sectors including education, health care, small enterprises and agriculture. However, for this to be sustainable and effective, communities must have effective and affordable access to ICTs. For a variety of reasons, they do not. An option that is being increasingly considered involves developing communication strategies based on an integrated approach which relies on more traditional communication media serving as an interface between ICTs and rural communities. This chapter highlights the work of FAO in the area of communication for development methodologies used in rural radio, and how radio and communication for development methodologies, coupled with technological innovations, can help rural communities access the knowledge and information they need to improve their living conditions. Mass media are of crucial importance in rural areas of developing countries to run large scale communication campaigns on health, nutrition, livestock breeding or agricultural technology transfer. Equally important, however, is their role in communicating the information needed for individual's every-day lives - from market prices and credit facilities to weather reports, music, entertainment and culture. Particularly in large rural areas where population density is low and telecommunication facilities are scarce or non-existent, mass media can reach rural dwellers helping them to be informed and able to express their own concerns, thus fostering national identities and reducing the rural/urban divide. Media and communications have been effectively employed since the early days of development assistance. Their application was noticeably influenced by the various post-war development theories and, to a large extent a top-down approach has dominated the scene. Radio, television, cinema, print media and theatre have been regarded as instruments through which the masses could be exposed to new ways of thinking and taught new attitudes in order to stimulate economic development. However, over the years the so-called masses have begun to appropriate these tools and to stimulate a truly bottom-up development. One notable example is rural radio. Created and established more than thirty years ago, rural radio originally referred to a service within the national radio broadcaster. Based in the capital city, its task was mainly to produce rural programmes which were then broadcast to rural areas on short-wave. Far removed from the reality of rural life, the programming that resulted from this top-down model was of questionable relevance to rural people. 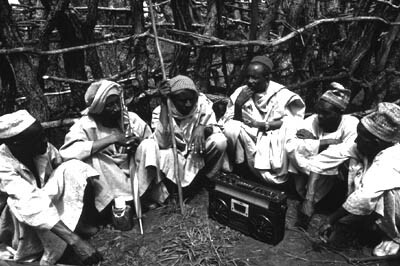 With the advent of low-cost FM transmitters and receivers, local radio stations were set up in remote areas of many developing countries. Community driven and above all local, these stations were distinct from their predecessors because proximity to their communities enabled them to be used for participatory communication processes - adding the voices, concerns and cultures of rural people to those of the experts from the cities. Local rural radio promotes social interaction by bringing people closer together, stimulating communication and enhancing the value of local knowledge. It helps rural people to be better informed about their own environment and their community's problems. In this way, they can more actively participate in development programmes and activities which allow them to improve their own lives. providing research and evaluation services, especially in the design and application of methodologies for analysing the content of rural radio programmes and evaluating impact. Integration: Rural radio stations must integrate a large number of concerns, themes and actors related to rural development. It is therefore important to encourage inter-sectoral collaboration and government, NGOs, donors, as well as the associations or groups that represent the rural world must all be involved. Interdisciplinarity: Rural radio production teams have to engage a range of topics and approaches and thus team members must have knowledge and experience in a variety of areas. Interactivity: Rural radio programming must be based on the concerns of the rural world and be presented in the form of an ongoing dialogue with the community. Priority should therefore be given to field production techniques involving local participation and close interaction with community members. Sustainability: Appropriate and effective legal, institutional and administrative frameworks are required for the proper management of rural radio stations and will ensure better use of human and financial resources, efficiency and thus a more sustainable operation. If local radio has been successful at promoting rural development, it is because broadcasters have learned how to listen to their audiences, got to know them, used their language, and enabled listeners to play a part in determining programming priorities and even in producing the programmes. allowing people to participate in evaluation of the radio station and its programmes. it is difficult to know rural people in all of their diversity and thus to know what they really want or need. Over the years rural radio practitioners have been encouraged to adapt Participatory Rural Appraisal (PRA) techniques to help them realize their objectives (see Box 1 p.50). PRA usually involves community level workshops lasting from three to five days and guided by a team of multidisciplinary facilitators who act as catalysts throughout the whole process. PRA can take a variety of forms when used in a rural radio station but is usually used for a range of particular reasons, including to discover community problems and priorities, to encourage community level discussion and action, and to generate content for the radio station. The FAO has successfully experimented with a multi-stage methodology that is well-suited to medium-size stations with a coverage area that includes a number of small villages. During the first phase the radio team gathers information and documentation on all aspects, domains and sectors of the community and its people. In this task the team members work with specialists from other sectors and domains of development such as agriculture, health, forestry, youth, gender and culture. This is followed by a short visit to the community to collect more data through informal interviews with local representatives of different social strata. Information gathered during this phase includes the history of the village, the themes that the villagers hope to discuss, the problems they face and their aspirations. PRA is a combination of research approaches and methods aimed at enabling rural people to share and analyse their knowledge of life and social conditions in order to plan, act, monitor and evaluate. It is a dynamic and interactive methodology which is reviewed and refined in order to adapt to different environments and priorities as they emerge during the process. PRA was firstly developed in the 1980s by NGOs operating at grass-roots level as a means of gaining an understanding of the issues and priorities of a given community. Throughout the years it has evolved in terms of its methodology, the tools employed and particularly in the various ways it is applied. Compared to other research methodologies, which mainly aim at extracting information, PRA emphasizes empowering local people to take an active role in analysing their own living conditions, problems and potentials with the intention of changing their situation. These changes are achieved by collective action and local communities taking responsibility for implementing the agreed upon activities. PRA techniques and tools have been effectively used to examine problem areas in a variety of sectors such as health, agriculture, forestry, women's issues, nutrition; and facilitate inclusion of the direct beneficiaries in decision making processes, capacity building and development of new project ideas, methods and applications. Attitude - workshops are effective when they succeed in building positive relationships with local women and men. Outsiders must have respect, humility and patience, and a willingness to learn from the local people. When the preliminary research is done, the radio team returns to the village for seven days to produce the programme. Day 1: The team arrives early in the morning in order to have time to conduct courtesy visits to local authorities and leaders before arriving in the village around midday. Once in the village, the members of the team will greet villagers and then make their way to the huts or lodging provided for their accommodation. Day 2: The team begins to mix with the locals, participating in whatever events or activities are going on (baptisms, funerals, cultural events, agricultural work). All team members must take part in participatory observation in order to familiarize themselves with local faces and surroundings and to establish initial relationships. On the second night, the team may be able to organize a cultural evening, during which they can record traditional music, tales and proverbs for use in their programme. Day 3: The team now knows many of the village leaders and has identified some themes and subjects which could be used for the programmes they will produce. This day will be dedicated to visits and informal discussions, and to preparing discussion guidelines. Day 4: Informal discussions continue. When the team feels that a certain degree of trust has been established with the local people, tape recorders and microphones are taken out of their boxes and the first interviews are recorded. Day 5: This day is dedicated to recording interviews, music, sound effects, testimonies, statements and proverbs. Day 6: The recorded material is put together into a magazine format programme. In the afternoon or evening, the team organizes a group discussion on the theme of rural radio, and listens to suggestions, comments and criticisms made by villagers about the radio station's programmes, broadcasters, listening hours, signal reception and so forth. Day 7: At the end of the stay, the rural radio team thanks all the key people in the village, and the region. The team leaves all its remaining provisions with the villagers. When the programme is later broadcast it is heard by people in villages across the station's coverage area, enabling communities to share their experiences and to learn about the problems, solutions, cultures and lives of other communities in the region. This methodology works in many ways and at many levels. Within the village being featured, the participatory and research-oriented production process promotes discussion and reflection. This continues when the programme is broadcast after the programme producers have left the village. At its most successful it can provoke lasting change in a community that is empowered by the knowledge that its concerns are valid and its people's voices can be heard. The programme also promotes communication between villages. Among other things, this can promote innovation as the members of one community learn the solutions that others have developed for common problems. Finally, while participatory processes are not simple, for radio stations they provide an effective way of learning about community concerns, of producing relevant content, and of evaluating programming to ensure that it remains relevant. ICTs potentially offer powerful tools for providing farmers with the knowledge they need to put agricultural innovations and socio-economic opportunities to best use. They can make new information resources available and open new communication channels for rural communities. But for many developing countries this potential is not readily accessible and the ride towards the information society must follow alternative routes. There is a need to develop creative applications for these technologies which take into account existing local communication practices, networks and channels, such as radio, television and theatre. The introduction of new ICTs should be done in a way that takes into account the fact that rural populations are more receptive to innovations introduced through trusted and reliable sources of information - people and institutions they are already familiar with and that are already part of their lives. These can help them share experiences, find common ground for collaboration and actively participate in and manage agricultural and rural development activities. In the Fall of 1995, ninety farm organisation representatives took part in a workshop on development communication where they developed an Internet based computer communication system. Most equipment was purchased by the farmers' organizations and preliminary technical support was provided by a local private technical university already offering commercial and not-for-profit Internet services in the region. A communication for development expert from FAO provided initial coordination and technical support for the first nine months of the initiative. A computer network server was installed at the university and each organization was issued an account for dial-in access to a small pool of three modems connected to the server. By June 1996, twelve farmers' organisations were connected and through the system, which enabled them to access several online information services. Plans were made to upgrade the system and involve all twenty-three farmers' organisations in the Rio Colorado Valley. Users submitted daily reports on irrigation quotas and planting activities to the local irrigation water authority. In Chile, the FAO Communication for Development in Latin America Project pioneered a participatory approach to the development of Internet-based information and communication networks among organizations of small-scale producers. These networks provided the organisations with data on crops, international crop status, market timing, prices, market conditions (regional, national, international), weather, technical and training information, and information about the various organizations that support their work. The users also had full access to the Internet to find other information relevant to their lives and communities (health, social service, education...), and they could use electronic mail to communicate with other farm organizations in Chile. The most important aspect of this initiative was its attention to local information needs assessments and provision of assistance to farm organization personnel to help them develop the skills necessary to analyse and disseminate locally relevant information. This methodology emerged from previous development communication experiences using small format video, print media and rural radio. It was very likely the most user oriented approach to developing Internet services in the developing world at the time, and it was focused on rural and remote agricultural communities that would normally have little opportunity to access the benefits of the Internet. The FAO approach to ICTs and development is based on the organisation's thirty-years of experience with participatory communication for development. The main objective is to assist farmers in developing indigenous communication processes through the use of media tools such as community radio, small format video and, as they have become available, new ICTs. This approach is not unique. It is as familiar to development workers as it is to people who do computer systems analysis and who know that their work (should) start with the needs of computer users. The communication for development approach does, however, provide development planners with a conceptual approach that puts rural people and rural organisations at the centre of any communication strategy design and in control of communication and information network development (FAO, 1990). A communication for development methodology, for example, was adopted in small pilot projects in Chile and Mexico. The aim of these projects was to assist rural communities and associations of small agricultural producers in the design and implementation of appropriate sustainable Internet communication and information systems. On a small scale, these projects have achieved important economic and social benefits for rural users (see Box 2). Since 1996, FAO's Communication for Development Group has been monitoring the rapid evolution of information and communication technologies and their impact on the social context of developing countries. In an effort to explore the potential of such technologies to support sustainable development processes, a multi-disciplinary working group on Electronic Information Services (EIS - see Box 3) was created with the participation of various representatives from other technical units within the organisation such as Forestry and Fisheries. The objectives of the group were to stimulate reflection on ICT for development issues that could lead to concrete action in various developing country locations, and to formulate suitable applications of the technology in support of agricultural research, communication, extension and training. EIS activities were based on local user community needs and enhanced information access and sharing at regional, national and international levels. The design of activities, whether for agricultural teachers and their students, extension agents and farmer clients or other intended audiences, incorporated the perceptions, attitudes and behaviours of intended users, along with the socio-economic, organisational, technological and information-content context in which EIS pilot projects were implemented and evaluated. The group held regular meetings to discuss and organize activities, not only within the organisation but also in close collaboration with other UN agencies and NGOs which shared the same interests in ICT applications for human development. One of the first activities sponsored by the group was a fact finding mission which included Canada, the United States, the Netherlands, South Africa, Zimbabwe, Zambia, Senegal, Egypt, Mexico and Chile. The mission was organized in collaboration with the University of Guelph (Canada) through the FAO's Programme of Cooperation with Academic and Research Institutions. It resulted in an extensive report, The Internet and Agricultural and Rural Development, which outlined the elements of a communication for development approach applied to the Internet and rural development, together with recommendations for strategy and activity areas, and an overview and evaluation of Internet activities in developing countries (Box 4). 1. Preliminary participatory communication and information needs assessments with intended users. 2. Awareness building campaigns designed to sensitize decision-makers to the possible uses of Internet services. 3. Executing agency commitment to participatory rural and agricultural development. 4. Local champions identified and supported. 5. Open participation of user community in design, implementation and management of communication and information services. 6. Institutional and user commitment to manage and sustain Internet services. 7. Involvement of the full community of users, including women and youth. 8. Ongoing provision for technical training, user support and outreach within the user community. 9. Combination of centralized and decentralized information production, analysis and distribution. 10. Ongoing provision for technical support and system maintenance/upgrading. 11. User community financial commitment in communication and information systems (e.g. ownership of hardware, user fees, salaries, infrastructure, etc.). 12. Social service orientation of local private sector or not-for-profit (university or NGO) Internet service providers. A key recommendation of the report called for FAO's support and advice on the design of an appropriate Internet for development strategy focused on rural and agricultural communities and the intermediary agencies that serve them. The cornerstone of this strategy was to be capacity building activities for rural organisations in order to enable and enhance locally managed Internet access, use, tools and resources. The EIS group's experience significantly influenced the work of the FAO Communication for Development Group in designing appropriate ICT applications for rural and agricultural development, especially by placing emphasis on enabling rural people to access knowledge and information according to their own needs, values and perceptions, and in the use of approaches and tools most suitable for rural areas. Despite widely-held beliefs regarding the importance of knowledge for development and the need to bridge the digital divide, the gap between the information rich and the information poor has continued to widen and technology alone will not be sufficient to bridge it. There are many reasons why poor farmers and food insecure residents of rural communities rarely put computers and the Internet at the top of the list of things they need to improve their lives. Knowledge is a long-term investment while water, food and health care are more immediate priorities for people without them. Further, they do not know how to use the Internet, there is little information of value on the Internet in their own languages, often they cannot read (most of the world's 600 million illiterate adults are rural residents), and consequently little of the Internet's content seems immediately relevant to their own lives. Fortunately the Internet is not the only way of communicating knowledge and information. In rural areas people are more likely to get information from the Internet indirectly via intermediaries - people and institutions having access to the Internet and who serve as bridges between information from outside the community and the information needs of the community. Examples of good intermediaries include extension field offices, rural NGOs, small and medium enterprises, health clinics, local government offices, and church organisations. These intermediaries combine their technical knowledge of the Internet with knowledge of and proximity to the community. In developing countries where rural radio stations are already a key component of local information and communication systems, they can also be valid and efficient intermediaries. FAO is working to narrow the digital divide in rural areas by connecting community radio stations to the Internet and training broadcasters to collect and adapt information for improved agriculture and food security. (see Box 5) In addition, FAO is working with member countries and other UN agencies to formulate national communication policies that integrate the Internet with conventional media, especially broadcast radio. Another good example of an ICT/radio application in support of rural populations is the Simbani News Agency, a joint initiative of the World Association of Community Radio Broadcasters (AMARC) and FAO. Prioritising information needs for development and food security, Simbani News will develop a multi-thematic approach covering human rights and democracy, gender and development, environment, HIV/AIDS and food security. Complex but vital information will be selected, adapted for use by rural communities, edited into easy to understand radio scripts, and distributed, via the Internet, to radio stations throughout Africa. The information will also be sent to national distribution points which will redistribute it via post or fax to stations without Internet access. Simbani works in English and French (Portuguese will be added later), but its text-based services will be translated into local languages by broadcasters in order to reach as many people as possible. As an important part of this service, AMARC will access specialized content on food security via a dedicated Web portal within FAO's World Agricultural Information Centre (WAICENT). The Simbani News Agency will inform, educate and sensitize both urban and rural populations on food security issues. Simbani's approach is innovative in other ways, too. Rather than content with a one-way news and information service, the news agency is adopting a participatory approach and it has equipped and trained fifty-four correspondents throughout Africa. Their task will be to ensure that the experiences and perspectives of their communities are distributed to the entire network, ensuring that indigenous knowledge is shared and that many African perspectives are represented. A project proposal for an integrated rural information and communication system using the potential of new ICTs in combination with rural radio stations illustrates the FAO's approach. This new project will build on an existing project in the south of Mali, where four radio stations were created to serve the development information needs of rural populations. Meeting these needs requires a variety of information from the national, international, as well as local levels, and thus calls for the implementation of an appropriate ICT methodology for the rural context and for the development of national expertise to help ensure sustainability. In addition to providing technical support, the project will train broadcasters in the use of new ICTs, with an emphasis on learning techniques for collection, processing and adaptation of information for broadcasting. The overall objective of the proposal is to promote the exchange of scientific and technical information between farmers and development agents, by establishing an integrated rural information system. It also seeks to develop a better understanding of the importance of information and communication in agricultural and rural development processes. 3. mobilising and sharing FAO's vast information resources related to sustainable agriculture, forestry and fisheries, particularly in relation to enhancing food safety, food security, poverty reduction, environmental sustainability and disaster prevention. The lead technical divisions for this programme are the World Agricultural Information Centre (WAICENT) which is an interdisciplinary programme for information management, and the Communication for Development Group which has considerable experience in participatory communication and rural agricultural knowledge and information systems. In recent discussions on the digital divide, many voices have been raised to remind us that there is a more alarming development divide which threatens opportunities for improving the livelihoods of millions of people on this earth. Access to relevant knowledge and information are critical to this concern. ICTs are powerful tools for knowledge and information sharing, for informing and educating people about new agricultural ideas and technical innovations, but cannot alone reduce this divide. To the contrary, if not properly used, with the intention of eliminating social inequality, they can worsen the situation. It is difficult to determine whether a specific medium is appropriate for development programmes. Often a mix of media may be more effective and efficient than any single medium. Effective use of a communication medium first requires an understanding of the knowledge and information needs of farmers and rural people. Only when this understanding has been achieved can there be the application of appropriate communication strategies, media and messages that better respond to those needs. Linking rural radio and ICTs is a good example of how two communication tools can benefit from each other and how the potential of one can be extended by the characteristics of the other. New digital technologies can help rural communities in their fight against hunger but in order to do this they must be based on innovative techniques and strategies that are built upon existing and trusted, communication networks. Only in this way can we transform the digital divide into digital opportunities. Ilboudo J.P., 2000. Méthodologie participative et interactive de la radio rurale.